Peer Resources is a group of 20 students that provides opportunities for communication and education to the MA community. The group is trained in facilitation and leadership skills throughout the year during weekly meetings. While gaining skills in facilitation and leadership, the group explores issues pertaining to high school student life and organizes events to fulfill the specific needs of the community. It sponsors lunchtime workshops and events that foster a greater understanding of self and others. The group is facilitated by Joani Lacey MFT, school counselor, and Sanjai Moses, Dean of Multicultural Life and Human Development teacher. 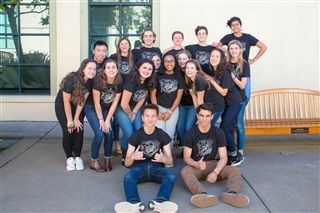 Students of Marin Academy's Peer Resources group invite parents and students to an evening of conversation as an exploration of the teen experience. Participants share insights regarding what it's like to be a teen or to be the parent of a teen. The goal of the evening is to enhance communication and understanding between the two generations through dialogue. The discussions shed light on the joys and obstacles each group faces, while providing a better understanding of what life is like for, and with, a teenager. The evening begins with a series of monologues and dialogues performed by the Peer Resources group that highlight different aspects and issues of teen life. Topics presented in the past have included stress, social isolation, sexual identity, race, class, trust, changing relationships with parents and peer pressure. The performances are followed by small group discussions led by members of Peer Resources; students and parents (not their own) then explore topics that were presented in the monologues, discussions that have been known to be quite lively! As always, a special thanks to David Sinaiko, Theater teacher, who is an integral part of Communications Evening. Communications Evening, Wednesday, November 14, 2018. Please contact school counselor Joani Lacey with any questions.